Offer additional comfort and safety when cooking with 12" fry pans, while keeping your staff protected up to 450 degrees Fahrenheit with this large-sized red pan handle grip. This durable, heat-resistant silicone pan handle sleeve easily slides on and off of your pan's handle for fast, efficient cleaning. This is a good grip and I would recommend it if you get the 12" non-stick pan here. The grip is a bit on the large size to fit my fingers at a normal hand size. This red removable silicone pan handle grip is perfect for the pans that we bought. They slip right over the handle and gives a comfortable grip. Good handle grip! Fit our 12" pan just fine, and we'll reuse it for future pans. Aesthetically it looks great, too -- nice bright red color. Would buy again, except I expect we won't have to for quite a while! These handles are great and fit perfectly on the Choice 12 inch fry pans. They're comfortable, stay on the pan, and protect your hands. These are a no-brainer for your fry pans. Great product. Easy to install onto your pan handle. However, you have to make sure you get the right size for you pans. When used correctly it minimized all the heat on the handle and lets you maneuver the pan at no cost. The handle is inexpensive, looks good, and feels great in the hand. it is a great way to upgrade a bare metal handle, and I'm glad that I purchased it. I find that using a larger size gives even nicer results ( I have this unit on an 8 inch pan and it is great), though the suggested sizes are adequate. Slide this on t the handle of twelve inch fry pans and provide your hands with protection from burns. This also has a great grip to it. It is important to make sure our kitchen team is protected from burn injuries. These silicone pan handle grips will help prevent injury from hot handles. This grip is heat resistant and will fit 7" and 8" fry pans. This removable handle grip is a very tight fit on my Choice 12" fry pan, but it does fit and does a great job of insulating my hand from the heat of the handle. I like it that the hole in the handle aligns perfectly with the hole in the grip so you can still hang your pots on a pot rack. These silicone grips work really well with the corresponding frying pan. They protect you from the handle's heat and I've found that you don't need to remove it when you clean the pan. Sir Clean recommended this product Red Removable Silicone Pan Handle Grip / Sleeve for 12" Fry Pans, we love the color, the material is really good, this pan handle is perfect! My experience with the Red Removable Silicone Large Pan Handle Grips for twelve inch fry pans holder has been great, as the bright red color was better than depicted on the website. I was surprised at the generous size and comfortable fit. The design makes it easy to fit any sized pan handle. I would like to see additional colors and styles. must have red removable silicone pan handle grip. perfect for the vollarath pans we ordered. safety first. no more grabbing a hot pan handle with out thinking. Ovearll, this is a great removalbe silicone pan handle grip, especially for the price. It is a good deal and a quality product. I would recommend. These Red Removable Silicone Pan Handle Grip/sleeve is necessary for the 12" Fry Pans but the problem is they slip off. If they did not slip off so easily I would like it more. I don't know why I didn't order these when I originally ordered the pans... they are very nice, fit the handle well, and make using the pans a lot more comfortable! Glad I ordered multiple sizes! Need to make it clearer which of these fit on which pan and or fry pans. No easy to do by pictures. But was easier to figure out the fry pans . I guessed on my sauce pan handles. Quality handle grip. Provides a good grip with the 12" frying pan I bought from here as well but seems just a bit short. Another reviewer suggested you buy the 14" one to fit a 12" frying pan. Seems to be well made and should last a good while. These silicone pan handle are great for keeping the handle cool. Can be used on top the range or in the oven. Hold up well to repeated use. Definitely worth buying if you get one of the 12" fry pans from Webstaurant. The handle is much more comfortable, so the pan is far more enjoyable to use. We are happy with this removable silicone pan handle. It's well made and fits our 12: fry pan like a glove. We would recommend this. These are nice silicone pan handle covers. They keep,the pan handle cool. We don't have to worry about burning our hands when handling the pans. I keep these handles on ALL of my cookware. I'm a klutz and the have saved me from burning myself many many times! I highly suggest them as they are very durable and have stood up to stove top and oven use! Useful product for larger fry pans, keeps hands and the contents of the pans safe. The red is highly visible, reducing the number of bumps the pans get on the stove. You can't beat the price here! 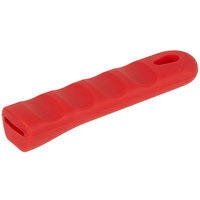 I purchased this red silicone handle grip for my 5 qt saute pan... no more hot handle. I will order more for my other pans. These are good but they do burn and melt kind of easier than I thought they would if they get left over the flame for just a few seconds. The Silicone Pan Handle Sleeve is a must in any kitchen. They slip on/off easily. Just make sure your pan has a thin handle cause the slit is not made for thick handled pans. Usually not a big fan of sleeves, they slide around and slip off. These don't. You have to put them in hot water for a few minutes before they will slide on, but once on, they stay on. Great product. perfect handle for the 12inch fry pan. it was hard to get it onto the handle but that is a good thing because hopefully it wont always want to slide off! nice color. I ordered this for my 12 inch aluminum pan that I also bought from this website. The red color stands out but does not look tacky at all. It has a hole for your pan so you can hang your pan with this still on it. It really does handle high heat very well so you can grasp it without any danger. Prolonged high heat and you will notice it heating up but you should be done cooking by then. Very happy! I purchased this to slip over my long stainless spoons, which tend to heat up, resting on the dish. Much cheaper than buying silicone tipped spoons, and can use for cast iron fry pans, after they come out of the oven. nice value, and an often overlooked kitchen essential. This is amazing. You will never burn your hands again or light a side towel on fire trying to grab a hot handle off the stove.